"We don't get it. One day she says we should do one thing, and then the next day she says something different." This statement is felt by all but spoken by Carmen, a student from one of the two communities involved in the project. The Maya youth in the Guatemalan pueblos of Chirijox and San Juan La Laguna speak Spanish and their indigenous language. My language limitations leave me temporarily in the dark. I do not completely comprehend her words, but the anxiety is evident. My coworker Marisol explains the tension. I have encountered this "problem" many times while working with youth. Students expect teachers to direct them what to do, when and how. This educational custom is present in Guatemala, especially for indigenous youth. Learning is scripted and disconnected from culture and community. There is little room for creativity or critical thinking. As a result, students are not used to having a say in their own learning, let alone directing it. However, during their participation in Unlocking Silent Histories, they are in charge, not me. 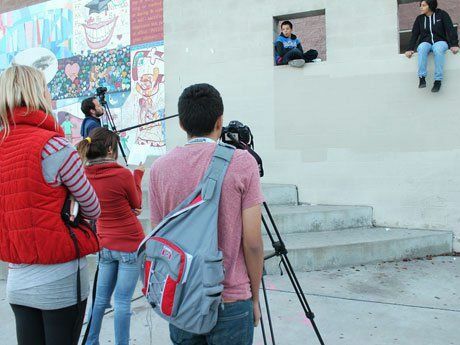 The foundational principles of this youth-led documentary project are student-directed learning and cultivating youth voice. Throughout this process, they learn film, sound and editing techniques. Yet the project is not just about making films or learning technology. It is about developing critical and creative expression that connects history to the present. Following Carmen's experience, we glimpse the three facets in which youth engage during this project. These stages may appear to be linear, but they are interrelated. Carmen's confusion about what to do comes after one of our workshops. Following a viewing of When the Mountains Tremble, Pamela Yates, the co-director of this documentary portraying the 30-year Guatemalan armed conflict, joins us through Skype. This first stage prepares youth to become critical consumers of media, analyzing the validity of media representations. Pamela and I encourage students to explore stories that they are passionate about and connect those stories to their community and history. This is where Carmen becomes puzzled. In an earlier workshop, she interpreted that the "directions" were to focus on a problem in the community. Now with this new message, Carmen has an unfamiliar task ahead of her. She's been given the option to decide for herself which direction is most meaningful to her. Second Workshop from Donna DeGennaro on Vimeo. The creation of an evidence-based documentary is the second phase. Carmen grapples with a focus and decides on investigating the disconnected relationship between nature and people in her community. Originally when she tried to organize her story, it quickly became too large. She saw this herself and decided to narrow her focus to deforestation in her community and the importance of trees. The story creation process emerges as Carmen develops interview questions to find out what her community thinks about this topic. How she chooses to represent her ideas has also changed through conversations that challenge her own beliefs. She synthesizes the different perspectives about nature, who has them, and why they have changed. "My ancestors used to ask permission to cut down trees, but when religion came, we stopped doing that." Carmen on religion from Donna DeGennaro on Vimeo. In that pivotal moment, Carmen is uncovering a past that was unknown to her before. Her final documentary is a culmination of decision making about which videos and interviews depict a message that integrates her community's thoughts. She also includes subtitles, as her interviews are mostly in Maya K'iche'. After Carmen and her peers complete a draft of their productions, they arrange a town showing. Carmen is first. She introduces her film and later fields questions and facilitates a discussion, while Marisol and I stand silently in the background. The information gained from the audience helps her to improve her film. After they adjust their films, she and the others from Chirijox share their documentaries with the youth in San Juan, and vice versa. They also come together to present to a larger audience in Panajachel, a town half way between Chirijox and San Juan. The aim of this third phase is to promote cultural understanding, highlighting similarities and differences across communities. Carmen Promo from Donna DeGennaro on Vimeo. While Carmen struggled in the beginning to find her way, she embraced taking the role of directing her own learning. In fact, each student adopted this project through his or her own avenues and interests, as well as at his or her own pace. Their stories included themes reflecting personal messages and Maya culture. Many of them had never touched a camera or computer, yet the products materialized into professional documentaries and each story reflected different student personalities. Carmen and I talked after she finished. "We know our ideas," she said, "but we didn't know how to go deeper. That is why we are students of this project." Yet Carmen is not only a student -- she is a teacher. In fact, she will be teaching the next group of youth. The implications that have come through in my discussions with each of them is that, in taking ownership, they teach themselves, engage in self and peer talk, and develop a sense of confidence in their voices.